Each dataframe has the Date as an index. Both dataframes have the same structure. What i want to do, is compare these two dataframes and find which rows are in df2 that aren't in df1. 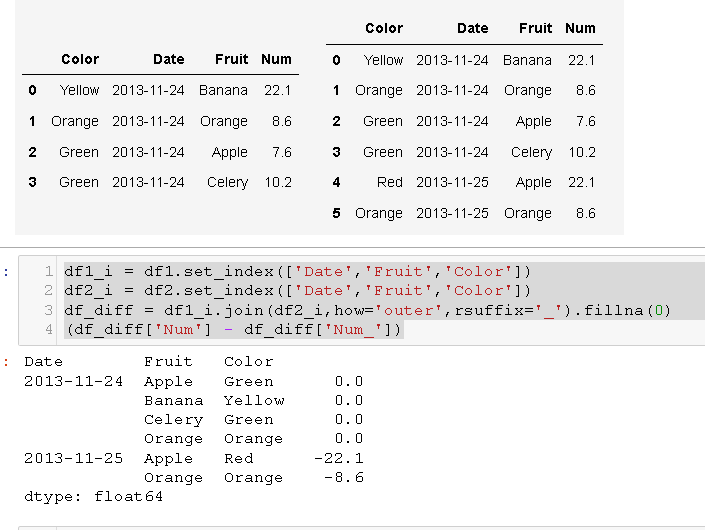 I want to compare the date (index) and the first column (Banana, APple, etc) to see if they exist in df2 vs df1. For the first approach I get this error: "Exception: Can only compare identically-labeled DataFrame objects". I have tried removing the Date as index but get the same error. On the third approach, I get the assert to return False but cannot figure out how to actually see the different rows. This approach, df1 != df2, works only for dataframes with identical rows and columns. In fact, all dataframes axes are compared with _indexed_same method, and exception is raised if differences found, even in columns/indices order. I got this solution. Does this help you ?